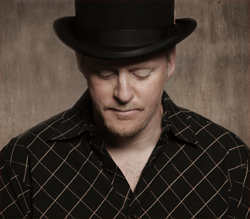 Wisconsin folk artist WILLY PORTER has been touring around North America for the past two decades, seeing national success that began with the release of his 1995 album, Dog Eared Dream, which led to opening spots for Tori Amos, Jeff Beck, Toad The Wet Sprocket, and The Cranberries and catapulted his style of folk rock meets Dylan-esque wordplay to the top echelon of modern singer-songwriters. His favorite track on the new album is “Psychic Vampire” because “I really love singing it”, he says, “it’s about how some people around you can drain you until you become just like them.” As for the title track (a clever, self-reflexive crime reference-laden ditty) and how it relates to the rest of the album, “Once the tune appeared, I thought ‘here it is, here’s the title of the record.’ I don’t really know that there’s a theme or it’s a theme-based record. Each song deals with different aspects of the human condition, but it’s not unified by the title in any way, but I guess that’s not for me to decide”, he laughs.